After Easter dinner, Boyfriend's mom gave me some of the leftover ham to take home. 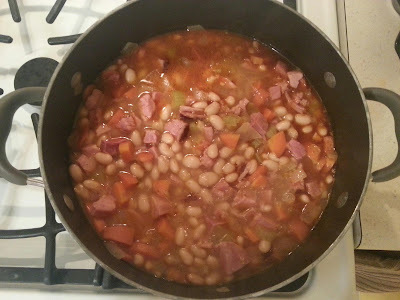 At first, I thought I would make a ham and potato soup... but then I decided that a ham and bean soup would be amazing. I'd never made one before, so I scoured the internet for a recipe that sounded good to me. And I found one! Yay! It turned out very nicely. I can't wait to make it again! !